We sat down with our Director of Sales and Marketing, Charleene Poissot to learn a little bit more about her. 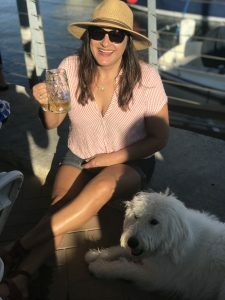 Beyond the incredible work she does for Holiday Inn San Diego Bayside, we found out about how she spends her time away from the hotel, her favorite hang-out spot in the area, and where she sees herself in five years. How long have you been working here at Holiday Inn Bayside? I started working at the hotel shortly after graduating from college and have been here for 26 years (27 in May). I started at the Front Desk and moved my way up as an FD Supervisor, Reservations Manager, and then into the Sales Office. From there, I held several sales and catering managerial positions before becoming the Director of Sales and Marketing (DOSM). I am originally from El Paso, TX, but I’ve lived all over as an Army Brat, including Germany for a total of 6 years. I moved to San Diego from Guam, where I spent 6 months “working” on the island right after graduating from Texas Tech with a BS Degree in Hospitality. After 27 years in SD, I consider myself a San Diegan! What is your typical day to day consist of as Director of Sales and Marketing? As a DOSM, my duties can vary drastically from day to day. Some days are heavy with RFPs (requests for proposals) and negotiations, and other days are meetings heavy discussing revenue strategies, marketing and e-commerce. There are also days where I have more client interactions which I really enjoy, as building relationships is what this job is all about. The majority of my time is spent directing my team to make sure that we are making our best sales efforts to meet our revenue goals and ensure customer loyalty. I feel most rewarded by exceeding our guests and group’s expectations and having them return as repeat customers for many years. I am equally excited about having a happy team that is thriving and successful! I’m passionate about suggesting improvements and/or changes to the hotel that result in an improved product and/or service to our guests to keep us competitive and current. It’s always so fun for me to take a break from some of the traditional DOS duties and maybe find some cool new chairs for a spot on a patio, or create new signage for our elevators. What do you like doing on your day off or time away from the hotel? I love to travel and stay in hotels! I’m a big fan of international travel and love observing other cultures traditions and customs and seeing all of the beautiful things each city has to offer. When I’m not at work, I’m always with my family – usually gardening, cleaning and grilling or cooking. I love indoor houseplants too and spend a lot of time nurturing those as well. I love to stay active and can be seen walking my Huskipoo all over Point Loma. When I’m away from home, I’m out checking out new coffee shops and restaurants or supporting our local favorites. I also enjoy shopping for home goods, as I am obsessed with interior decorating! What would be your favorite hang-out spot in the area to suggest to a guest? So many fav spots, but I really love the area directly across the street from our hotel! There is a scenic walking/jogging path that runs along the San Diego Bay with so many great waterfront restaurants. There’s also a brewery that really captures that San Diego vibe that our visitors come here for. You can rent kayaks and stand up paddleboards to paddle around the marina with some of the best views of our downtown skyline. Nothing beats ending a hectic day and walking across the street to enjoy a cold pint and some fresh fish tacos. If you’re lucky, you’ll even see the sports fishing boats come in with their fresh catch. With Bartell Hotels until I retire! I would be happy to continue at the Holiday Inn Bayside as a DOSM, but I would also consider a position within the company if the right opportunity presented itself. I really appreciate working for a local, family-owned company that takes such great care of their employees and makes us feel like family.